Hi guys. Here we are... spring break. We partied with family and friends at the ice rink on Friday night to ring in Joe's 13th birthday, and then I woke up at about 4 am on Saturday to that awful dizzy feeling and stomach flu hit me full force, about ten minutes later. I was hoping and praying I was the only one in the family, and just really run down from all the March activity. (Which was probably very true.) (I got hit with the worst stomach flu I've ever had last year during spring break and spent five days in bed because I was so weak I could barely move.) My man graciously decided to take the hoodlums out for lunch and a movie so I could sleep, and it was one of those "I slept half the day away but thought it was five minutes" kinds of sleeps. Sadly, one of my little punkins who seemed perfectly fine all day Saturday, actually got suddenly very sick without warning, and threw up at the movie theatre! Ugh. And I wasn't there to help her and deal with it. (Not to mention that I'm sure we just exposed half our city to the flu.) (Mom fail.) Apparently a very nice Canadian woman (or presumably Canadian since she was wearing a shirt that said CANADA on it) came rushing up to Ava in the theatre hallway (where she had just puked- bless her heart) and put her arm around Ava, asked which theatre her parents were in and assured her that she was going to be okay and that she would alert the family. Ava was so embarrassed but this lady was so sweet and helped get Adrain and Joe so they could take her home. Sometimes the kindness of strangers is staggering, and as a mama I sure appreciate that sort of thing, especially when I felt like I was on my deathbed about that same time! Man, I want to be like that when I see someone who just needs a little mama love. Okay so anyway, we're praying like mad that the boys don't get it and it seems like maybe (hopefully?) it was just a 24 hour bug. Joe had a flu shot and I never did get Ava's scheduled. (Another mom-fail? I'm choosing to let that one go.) On the bright side, I think this means I don't have to do my ab workout today, yes? Here are a few shots from Friday night's festivities. The highlights were definitely the friends and family who came to celebrate Joe (and those that couldn't make it were missed!) The other highlights were the music they chose to play. It was all eighties and early nineties music and my BFF Alli and I were so busy singing together we kind of ignored our kids at one point. Ha! Good times. We also loved seeing the friends our son has chosen. Such good kids. The low point was that one of the boys who came fell and hit his head on the ice and we had to call his parents to come pick him up. My heart broke because he was crying and then of course embarrassed to be crying but in obvious pain. I was so grateful that my Dad was there, being a former EMT. He was checking this kid all out for concussions and that sort of thing and sitting with him, holding ice on his head, and just being a good grandpa. I loved that. Gotta love a man skating with is daughter. I had four little nieces skating all over the place. Such cutie pies. I have to take a minute to talk about this one... Out of all the people I know on this earth, I'd have to say that she has the sweetest heart I've ever come across. See those cute beaded hoops she's sporting? Yeah, she made a bunch of those and had me sell them in Instagram so we could donate all the profits to the Red Cross for the victims of the awful mudslide that happened here in Washington. So many people lost their homes and loved ones. It's been heartbreaking to hear the stories and she went to school and tried to start up a canned food drive there for that too. (They had one in the works so she can just help out or contribute.) (I loved watching some of you snap up her earrings and you totally blessed her heart. I loved watching her write little thank you notes to each of you too!) She is precious and I can't wait to see the big things she will do with her life, out of that love for others. It's contagious. 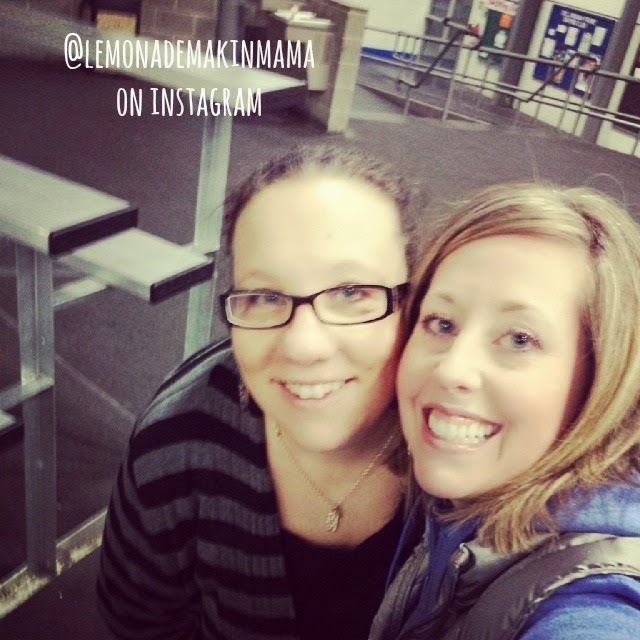 My girl Alli, (@jewishmama on Instagram) and I hanging out (aka freezing our butts off!) Love this lady. 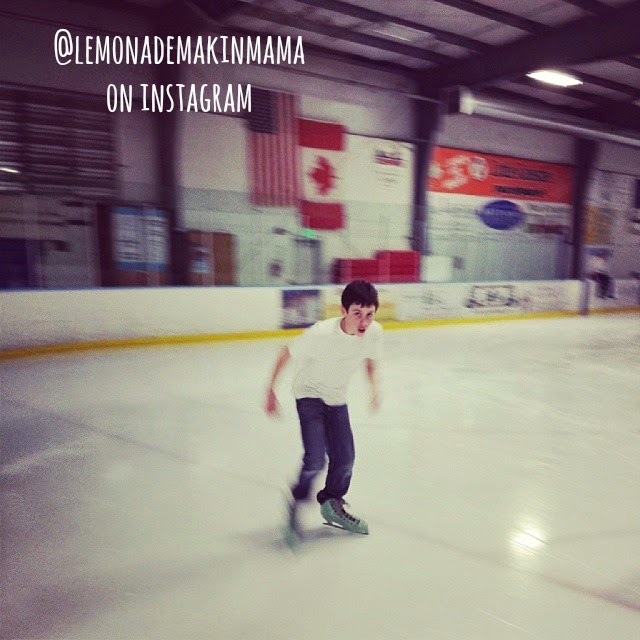 And like I said on Instagram at the end of the night as he did his little solo birthday lap... That blur on the ice- Yeah, that's my teenager! Oh, I hope you all feel better soon!!! I was sick "with" you last year...And it was HORRIBLE. I got my spring flu out of the way just a few weeks ago. Ugh! Feel better quickly!!! Looks like Joe had a great time celebrating!! Get better soon! I hate throwing up...............you will be glad to know it is not the flu. A stomach virus is different. Praying your plans work out for the rest of the week!!! I am so so sorry for you and ava...I hate hate puking!! But I must say you crack me up even when you talk about puke!! Bless your mama puking heart. :( Our family had a similar puking flu in Feb and it was miserable. It comes on super quick and lays you flat for 24 hours. If it makes your heart feel less guilty about your sweet girl the flu shot isn't for the puking flu, it's for influenza which isn't the same thing. amps up the hotness factor. you are hilarious!! so sorry you were a sickie...and ava as well. poor thing. and YES the kindness of strangers is indeed often such a blessed surprise! hope all is aok up there !!! Looks like you all had a great time. Hope "the girls" are feeling better, and that "the boys" avoided the crud! The party looks like a blast! What a sweet lady to help your daughter...there are still so many lovely people out there and I am glad one was there. Glad you are better and hoping the buys stay well. Enjoy your week! I'm so sorry you were sick and glad it's over. Looks like a great party in spite of bumps and bruises. Girl, you are blessed with a wonderful family and I don't even know them. Looks like Ava is following in her mom's footsteps. Such sweetness! Such cute party pics!!!!!!!!!!!!!!! Our house is battling the stomach bug too. Fortunately its been quick recover but a long lag time between kids getting sick (last Thursday morning and then last night.) Hope you are feeling better quickly. Ugh! stomach virus is the all time WORST and I do hope that the rest of your lovelies didn't get it. Such sweet pics and yes, a "hot daddy" is a hands on Dad, no matter whose child. Think he's a keeper! And, your sweet hearted daughter............Happy week!